How to lock and unlock your hot tub keypad? The "lock" function, available on some keypad models, can be very practical if you do not want users to interfere with its operation (filtration cycle, purge, temperature...). We can think of a cottage clientele, for example, or even children (who will of course not be left unattended). The total or partial locking allows them to use the hot tub equipment such as adjusting the intensity of the jet massage or lighting, but prevents unauthorized system settings. Locking is therefore very practical, but it is obviously essential for you to know how to unlock your keypad. If you do not know how to restart it, tubs.fr lists below the steps to be taken to unlock it, depending on the model of the control system on your spa. Feel free to also refer to the instructions for use provided by the manufacturer, and to contact us for any request. Note: On some systems, the "Jets 1" button instead of the "Blower" button is used in lock/unlock sequences. Locking and unlocking the panel for the spaTouch touchscreen keypad : To lock, choose the "Lock" option from the menu and define the settings. To unlock, press the central grey button for 5 seconds. Only some systems in theGL range (GL2000 M3, GL2001 M3 and GL8000) have the lock option depending on the keyboard used. Locking and unlocking the panel for the ML700 and ML900 keypads : To lock, press "Time", "Jets 1" and then "Warm" within 3 seconds. Once locked, the "PL" indicator light will illuminate. All buttons are locked except the time button. To unlock the panel, press "Time", "Jets 1" and then "Cool". The other ML series keypads (200, 240, 260, 400, 551 and 554) do not have the locking option if they are used in the main panel. If one of these keypads is used as an auxiliary panel, it locks when the main panel is locked. To unlock this panel, the main panel must be unlocked. Only the in.k500 keypad has the lock function, via the "Keypad settings" menu. Panel Lock: Select one of the 3 security levels, "Unlocked", "Partial" or "Complete". The Partial level locks the setpoint setting and several options in the settings menu. The "Complete" level locks all keyboard functions. Panel Unlock (partial or complete) : Press the upper right key for 5 seconds. Astrel, MSPA and SSPA systems have the option of partial or total locking if you use the display keyboards in the TSC range such as TSC-4 (8 keys or 10 keys), the TSC-8 7 keys and the TSC-18. When the panel is fully locked, all functions are disabled. When the panel is partially locked, the basic functions remain accessible (pump, turbine and light activation), but it is not possible to change the set temperature, disable the Economy Mode or access the programming mode. Unlocking the panel: Press the Pump 1 button for 5 seconds. The SP800 andSP1200 SpaPower control systems have the option of locking with the SP1200/SP800 keypad. Panel Lock: Press and hold the "Down", "Scroll" and "Up" keys simultaneously. While you are doing so, the LCD screen displays "Hold the keys to activate the lock". You will need to hold the buttons down for about three seconds before the lock is activated. At this point, the touchpad beeps and displays "Keyboard Lock". Unlocking the panel: Press "Down", then "Scroll", "Down", "Up" and finally "Scroll". The touchpad beeps and temporarily displays "Keyboard Unlocked" when the sequence is correctly entered. Note: If the controller is turned off while the key lock is active, the key lock will not be restored when the power is restored. 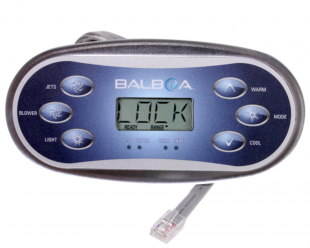 The NEO2100 control system has the option of locking with the 1100 and 2100 keypads. Panel locking: Three locking options are available. "Panel" locks all keys except "Menu". "Temp" allows you to lock only the temperature. "Menu" allows you to lock everything. Unlocking the panel: Press the "Menu" button for 15 seconds to unlock the keyboard once it is in lock mode. SpaNet (XS-2000, XS-3000 and XS4000) control systems using the XS3000 keypad have the lock option. Unlocking the panel: Repeat the same combination.